I suppose you could say it was Merv Lincoln who started it all. Mervyn George Lincoln, born November 1933, was an Australian middle distance runner who, in the wake of the great John Landy and contemporaneously with international world record holders like Derek Ibbotson and László Tábori, helped transform the mile race into an event that drew huge crowds, the images filling the front pages of newspapers. And so I was easily tempted away from my books in Melbourne University's Baillieu Library this very week 59 years ago — 23 March 1957 — to stroll the short distance to the running track where Lincoln was going to attempt the four minute mile. 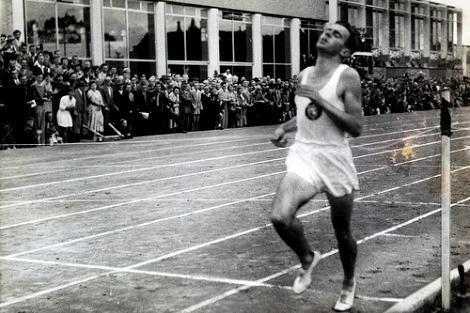 In the recent National Championships, Lincoln had failed to crack four minutes and been beaten by a newcomer, Herb Elliott. But now, a couple of weeks later, against a strong field and paced over the first two laps by a promising 19-year-old named Ron Clarke, Lincoln was having another shot. As a postgraduate student with an accommodating timetable, the flexibility of which I was putting under serious strain, I went to watch the race, more out of curiosity than a committed interest in athletics. I played football and cricket in their seasons and squash most of the year round. I was not a runner. The four minute mile had so captured the public imagination in both hemispheres that it was not surprising to find the tight surrounds of the circular track packed to overflowing. Lincoln was ready for the challenge. It was, as he recalled it, 'a beautiful day for running, no wind, a slight dampness in the air and despite the ... huge crowd, I felt that the atmosphere was village-like'. Anyone who saw that run remembers Clarke leading the field through a furious first two laps. Then, in Lincoln's words, 'I flew home over the last two laps, with the crowd roaring encouragement. After [the finish] there was an anxious pause of three minutes, as the timekeepers compared their times. It was unanimous; I had run the mile in 3 minutes 58.9 seconds.' In Dublin the following year he ran 3:55.9. Though I remember with great affection that shining day at the Melbourne University track, it was not that occasion which put Lincoln firmly into my consciousness where he has remained ever since. That crucial day came in March 1970 — though I couldn't vouch for its being the 23rd. "Once I had conquered the intense desire to give up, I gradually discovered a new personal phenomenon: I could run a long way — not fast but relentlessly!" As the new academic year began, my second as a university teacher, I found myself overweight and unfit and in only fair health following a bout of peritonitis. Injuries had ended my football 'career' some years earlier; a young and growing family had rendered long Saturdays playing cricket both difficult and, more to the point, strangely unpopular. I still played squash, but an hour on the squash court once a week was not the answer. At this critical moment I heard Lincoln interviewed on ABC morning radio. His fine track career and distinctions were now, of course, well behind him, but he was still involved in athletics and fitness. Just half an hour's running each weekday, I heard him say, would soon improve your general condition and be excellent for the cardiovascular system. Always an early riser, I was out on our quiet country road the next morning around first light intent on running just half a mile. Start quietly, I thought. Be sensible. Some days later, when I had recovered and various outraged muscles had stopped twanging, I determined to carry on. Lincoln had made no promises. It was just good advice to take or leave. Once I had conquered the intense desire to give up, I gradually discovered a new personal phenomenon: I could run a long way — not fast but relentlessly! In those early 1970s, however, running, especially at odd times, was still regarded as eccentric, maybe even sinister. 'Why do you do it?' the 'milky' asked me one morning, pausing for his 'smoke-o'. 'Are you a footy umpire or somethin'?' And then there was the elderly bloke who, driving past in his ute, stared back at me for so long to demonstrate his scorn and disbelief that he drove off the road. But I was undaunted, full of euphoria and endorphins and a 'wild surmise', like Keats' 'stout Cortez', though unlike him I was no longer stout, girth and weight having been left behind on countless cross country trails and several marathons. As a fellow runner I only hope you don’t have to give it up. My daughter shamed me into running with her a few years ago. She gave it away soon after but I continued. At nearly 63 I still enjoy three longish runs (10 km +) most weeks. I’ve been fortunate not to have serous injuries, maybe because I started running later in life. There are health benefits but I just enjoy it. No other reason motivates me as much. I ache, I sweat and I hurt all over sometimes and on winter mornings I question my own sanity. But that is all part of the joy. Running gives me something intangible, whether it is jogging along by the local stormwater canal or running between postcard mountain villages in the Bavarian Alps. I can’t find the right words to describe it and maybe that’s good. I could not do it justice. I run half marathons at my own pace and I’m unlikely to ever win a race unless I do a Stephen Bradbury. But that isn’t the point, is it? Just doing it is what matters. Anyway, best of luck with your sacroiliac and don’t throw out the runners just yet. An inspiring, and smile-provoking read, thank you. This favourite verse from Kevin Brophy's "Forty-Five Years on a Bicycle" may bring some consolation: "The bike is a dream of low flying,/deep diving in air against the bluff of wind,/it teaches us hills and timing, slides us into curves/like a poem that fits this world./Even the map of our country is the outline of a rider/crouched over a machine of wind and motion,/a dragon shadowed by its jockey/whose shape strains to hold in the spin/and dip of this planet of waves, sand and ice. ... strangely unpopular. I love it. '...he drove off the road.' Yes, I am afraid my greatest barrier is not time nor muscular, it is danger. I have this live cartoon in my head that has major traffic catastrophes in my wake. Yet, after reading your offering this morning Brian, I will again risk all and face the score and pain to spritely perambulate. Ah, the sacroiliac - who designed that poorly engineered and obviously prone to fail joint? If I didn't know better I'd suggest it was someone from Ford or GMH. And unfortunately, Brian, it probably won't like cycling either. But there is another way. Just google 'Greenspeed' or 'MRT recumbent', to find a strange machine that will keep you on the road, heart pumping, and probably attracting looks similar to that from the old bloke in his ute. And even if you have to give up running, please do not give up writing. The brief moments of sanity I get from your articles are invaluable. Brian, thank you for your words that fall like music on my mind. At 71 years I am a 'crazy' triathlete who runs, rides, swims three times every week. And I credit John Landy, Herb Elliot and Percy Cerutty for inspiring me in my youth. I have been running since i was a small child and the pleasure is still there. May you find an alternative - that just might be the ABC program Catalyst this week that investigated pain and some solutions. I run through the pain of a 5mm scar on my medial condyle from a marathon in 2002, goes after about 1k. Ah, memories of Merv Lincoln teaching Accounting 101 at RMIT back in the day. A real gentleman. Merv was also my hero. I was a boy living 2 blocks from his dad's shop in Mate St North Albury in the 1950's. I am also still running - no more marathons but 5 to 10 km at a much slower pace than I once ran the 42; bike riding on the weekends may have lessened injuries, tho a few funny things in the lower spine remind me not to overdo it. Thanks for the start, Merv.